At fifteen, Jem has seen more hardship than most. She's been shuffled from foster home to foster home in bad neighborhoods with uncaring teachers and foster parents ever since her mother died of a drug overdose when she was seven. But even all of the awful homes and people aren't nearly as bad as the numbers she sees—eight digit numbers that appear whenever she meets someone's eye, predicting their date of the death. This terrible knowledge forces Jem to withdraw within herself and never make friends...until she meets Spider. Spider only has a few weeks left, so she feels compelled to be nice to him. But when on an outing at the London Eye with Spider, Jem sees something uncanny: everyone around them has the same death date. Today. She and Spider flee the scene, only to witness a bomb explode minutes later. Now on the run, Jem must confront her fear and her issues with her ability, and her growing feelings for Spider. 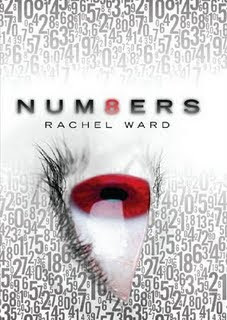 Rachel Ward's Numbers is a surprising novel with a very interesting and unconventional concept. Jem is a very honest narrator, someone most of us would describe as from the "wrong side of the tracks". Her life is hard, and it has made her a very tough and determined person. Ward speaks very realistically about what life is like for Jem and Spider, living in the projects with teachers and other authorities thinking less of them because of their background. Her take on them and their situation really makes you understand why they might be considered "problem kids" and why they fear the police, but also makes you very sympathetic towards them as well, even if they’re views might be a little skewed. As for the plot, Ward did take some time setting it up, and you do expect a bit more of an action-packed read as the pace did slow and the story dragged slightly in the middle while Spider and Jem were fleeing, but the novel isn't really as much about the action and adventure as it is about Jem learning to open up and live a life despite having her morbid ability as she falls for Spider and begins to understand her mother and her actions. Of course, the romance is wrought with tension as Jem knows that Spider's time is winding down, and she struggles to come up with a way to save him without ever knowing what will ultimately take him away from here. The ending is both a little predictable and surprising at the same time, and it will be very interesting to see how Ward will continue the story in her planned sequel. Definitely check out Numbers if you are up for something both unique and convincing. Cover Comments: This cover really gives me the impression that this book is fast and action-packed. The red eye is kind of freaky, but the numbers written all over the cover fit. It's a nice cover, but I think I like the UK version better. ARC received from Amazon Vine and Scholastic. This book seems really great and very movie-like too. I wanna read it. I read the premise of this story a while ago and I think it sounds really good. It is one of the books I am most looking forward this year. I really liked your review. This book is moving to the top of my TBR pile when I finally get my hands on it. It sounds really good!